What is an OTA/COTA or Certifited Occupational Therapy Assistant? Now is probably a good time for us to go ahead and answer the quite frequently asked question, “What is an OTA? or COTA?”. You may be surprised to hear that Occupational Therapists and Occupational Therapy Assistants aren’t extremely well known, or mainstream, yet. When compared to very similar professions like Physical Therapy or Certified Nursing for example. I consider this a good thing, it means more opportunity for those currently in the field or entering the field now while it is still growing substantially. I digress. Back to the question at hand: What is an OTA/COTA? Today’s post will shed light on your questions about what a COTA is, what they do, and where they work. What is an OTA vs What is a COTA? Quick Recap: What is an Occupational Therapy Assistant? First, a quick distinction on the “C” when answering what is an occupational therapy assistant. 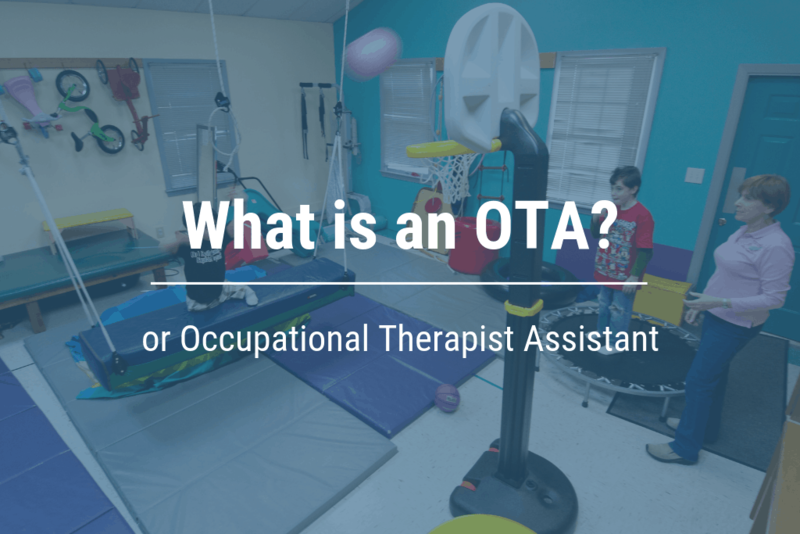 An OTA or COTA is the assistant to an Occupational Therapist. The “C” simply stands for “certified” and means that the OTA has taken extra steps in addition to holding their state license as an OTA, to also become certified by the National Board of Certified Occupational Therapists (NBCOT). This “C” distinction is similar to how an Occupational Therapist, or OT, is also called a OTR/L where the R = Registered and L = Licensed. So, OTAs are educated at an accredited OTA program and then take the necessary steps to obtain their state OTA license. Where COTA professionals take one additional step and get certified with the NBCOT. But that doesn’t fully answer the question, what is an OTA. Aside from assisting an OT, what does that really mean or look like in the real world? 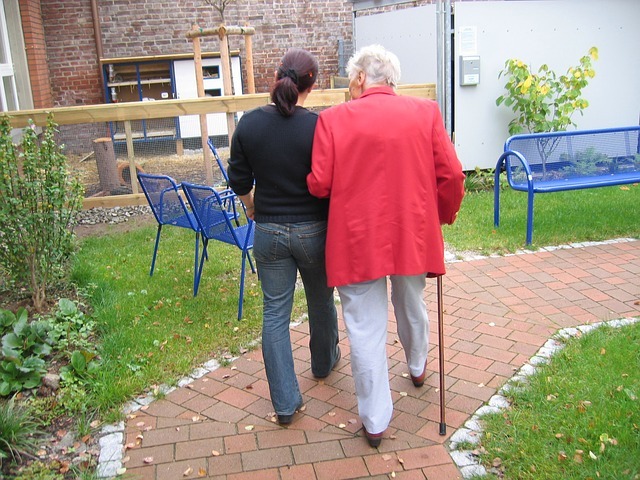 Here an OTA working in a nursing home assists an alzheimer’s patient on their walk. Although Occupational Therapy Assistants work in many different places, there are 3 main places you can find them. There are also traveling OTAs that serve patients all over an assigned territory at various locations. The reason OTAs work in these places is that their patients are generally, pediatric, geriatric, or someone with a debilitating health condition that requires day to day assistance. Ok, so back to answering the question, what is an OTA? And this time in more detail than just the fact that they are an assistant to the OT. What does an OTA do on a day to day basis for their patients? An OTA is someone who works with young, old, or disabled people to help them through their day to day activities. They perform activities or “occupations” with their patients to help them maintain, develop, and progress fine motor skills or mental skills that the patient is lacking for any number of reasons. These reasons or problems may be physical, mental, developmental, or even emotional depending on the work setting and specialization of the OTA. Assisting disabled kids to fully participate socially and in their education at school. Assisting trauma or injury victims recovery by regaining cognitive ability and other life skills. Assisting elderly that experience various mental, physical, and cognitive disabilities such as dementia or Alzheimer’s. Evaluating a variety of unique patients and their family to help determine a plan and goals for Occupational Therapy Interventions. Implementing their individual therapy plans to help the patient improve their ability to perform their daily activities and meet goals. Monitoring the outcomes and making adjustments to the therapy plan as needed to ensure goals are met. Keep in mind these are just the main occupational therapy assistant duties. OTs and OTAs work in a wide range of industries for many different types of patients. So, this list could get much longer. But generally, now you know what an OTA/COTA is by definition. You also know where they work and what they do in the real world. 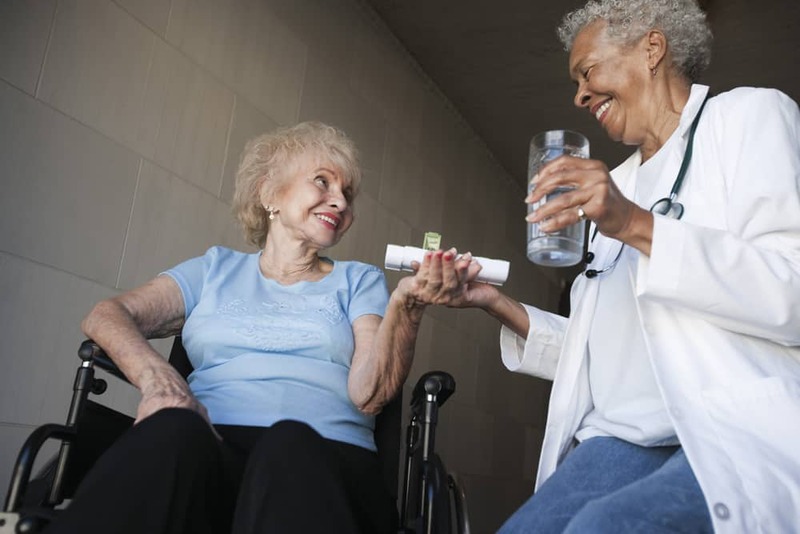 It doesn’t matter where an occupational therapy assistant is working, or who their patients are, they will all share these personality traits to be successful. Whether old or young patients of COTA are often in pain or struggling with some condition that makes their therapy challenging and at times frustrating. Occupational therapy assistants must be empathetic towards their patient’s conditions while helping them progress and push their limits with therapy. Although COTA complete a valuable education no class will teach this skill. Learning to walk the line between feeling empathetic for a patient and being able to motivate that patient is a skill that will only be developed through working with patients. This can be especially difficult for COTAs who work with children, in a school, or any other setting. Being able to walk the line between compassion and necessity is a skill learned on the job and not in a class. Well, now you can stop asking what is an OTA or what is a COTA. Definition: Assistant to an OT. The “C” just means the OTA took an extra step to get certified with the NBCOT. What: OTA/COTA professionals are helping young, old, or disabled people regain skills or assisting them with their daily activities. If a career as an OTA sounds good to you then checkout the requirements to become a COTA as well as our 7 step guide to becoming an OTA. Be sure to follow us on social media using the links above or below this post (header and footer of the site) and also to subscribe for more great resources for OTAs delivered straight to your inbox. I am pretty sure states require completion of the NBCOT exam prior to providing licensure; Therefore, an OTA would have to be certified (COTA) before receiving a license. That would mean a person could not practice as an OTA, only a COTA. That is right, Steve. Great point. Also worth noting that many, but not all, states allow practitioners to practice on a temporary license or limited permit while waiting to take or receive the results of the certification exam. Also, this article was written as an intro into the field for people who are curious about the OTA profession. The article didn’t distinguish between OTA vs “C”OTA requirements. So, thank you for the helpful insight!